Sandy Boucher is a writer, editor, writing consultant, and teacher. Her books on women and Buddhism were among the earliest examinations of western womens’ involvement in Buddhist practice. She has been active for 35 years in the San Francisco Bay Area and Pacific Northwest. She was awarded a Fellowship in Literature from the National Endowment for the Arts in 1979, and in 1989 Sandy earned a Masters Degree in the History and Phenomenology of Religion from the Graduate Theological Union in Berkeley. 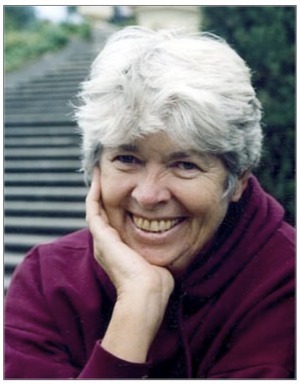 Sandy began to practice and study Buddhism in 1980, connecting with the pioneer Theravada/ Vipassana teacher Ruth Denison, who became her root teacher. In 1988 she published Turning the Wheel: American Women Creating the New Buddhism, a groundbreaking overview of women’s participation in Buddhist practice throughout the United States. Subsequent books on Dharmic subjects include Discovering Kwan Yin: Buddhist Goddess of Compassion, Hidden Spring: A Buddhist Woman Confronts Cancer, Dancing in the Dharma: The Life and Teachings of Ruth Denison, Opening the Lotus, A Woman’s Guide to Buddhism. Her latest book, She Appears! Encounters with Kwan Yin Goddess of Compassion, offers a western visioning of the Asian goddess through a gathering of stories and artwork evoking visions, dreams and other encounters with Kwan Yin. Sandy leads Buddhist meditation retreats on “Dharma and Writing” and “A Celebration of the Feminine Divine,” co-leads the “Meditation and the Spirit of Creativity” retreat at Spirit Rock Meditation Center in California, and, with her life-partner Martha Boesing, conducts the New Year’s Retreat for Women at the Great Vow Zen Monastery in Oregon. Visit our WATERtalks page for notes and audio from this talk.